First cut a 6" x 9" piece of turquoise card stock and fold in half for the base, a 4 1/4" x 5 3/4" piece of yellow for the middle layer, a 3 1/2" x 5 1/2" piece of white for the front layer, a 2" x 5 1/2" piece of Stampin' Up! All Abloom Designer Series Paper and a 1" x 5 1/2" strip of white. Then cut out the circle for the sentiment with a Spellbinders Nestabilities Eyelet Circle die, sponge the edges with Stampin' Up! Island Indigo ink, then with a Stamp a ma jig stamp the sentiment in Island Indigo ink. Next stamp the strip with a Stampin' Up! Plaid background stamp in Island Indigo ink. Then emboss the 3 1/2" x 5 1/2" piece of white card stock with a Cuttlebug Swiss Dots embossing folder. Next stamp the three flowers on white card stock in Lost Lagoon, Island Indigo and Daffodil Delight inks, the leaves in Stampin' Up! Mossy Meadow ink, and cut them out with Stampin' Up! Secret Garden Framelits Dies. Then begin assembling the card on the yellow card stock. Attach the embossed white card stock to the top half, the Designer Series Paper to the bottom half, the plaid background strip to the center, then the sentiment, flowers and leaves with mini pop dots. 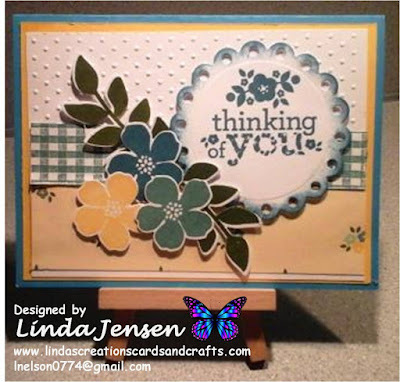 Attach the yellow card stock to the turquoise base and enjoy!